(n; imitative) 1. Deuces (2s). (Deuces are sometimes called ducks; see duck.). 2. In hold’em, 2-2 as the starting cards. (n; imitative) In hold’em, 2-2 as the starting cards. Comes from duck. (expression) “I have a pair of deuces”; “I’m betting some amount involving 22” (such as a raise of $2200). Comes from duck. (adj) Pertaining to four of a kind, as quad 8s. (n phrase) A shootout tournament (definition 1) with four levels. A number of tables of players each play down to one winner. Those winners then reassemble at multiple tables, each of which again play down to one winner, again repeat the process, and finally the winners of each of those tables compete in theplayoff. This form of shootout occurs only online. With nine-handed tables, 6,561 players would participate. (n) 1. In a high-low split game, as, for example, 8-or-better, a particular holding (or better) that a player must have to win the low half or high half of a pot. 2. Openers. 2. Qualifier tournament. (n) 1. The specific cards required to qualify. 2. Openers. (v phrase) A tournament whose prize is one or more entries into a tournament with a larger buy-in, often a major tournament. Often shortened to simply qualifier. (v) 1. Pertaining to a hand, have qualifiers. “Your hand is a nine; it doesn’t qualify.” 2. In casino stud poker, Caribbean Stud Poker, and other similar games, have a hand that contains some minimum requirement, say, at least, for example, an ace and a king. 3. Win one’s entry to a tournament from a satellite, as from, say, an online cardroom. “I qualified for the World Series online.” 4. Win one’s entry to a tournament by playing a specified number of hours within a specified time period (for example, at least 40 hours in a given month) or meeting other conditions of a promotion; such a tournament is often advertised as afreeroll tournament. (n phrase) A hand that has qualifiers. (n phrase) A hand that qualifies (see qualify) for low. (n phrase) A hand that qualifies (see qualify) for high. (n phrase) One that is of reasonable strength to win or to improve to win a pot. (n) Four cards in sequence of the same suit, that is, four to a straight flush. (adj) Winning one-fourth of a pot, usually due to splitting the low half of the pot in a high-low split game. This happens mainly in Omaha 8-or-better games. (n phrase) 1. A small home poker game, in which the stakes generally are nickels, dimes, and quarters. Also, nickel-dime-quarter game. 2. Any small-stakes game. Compare with penny-ante game. 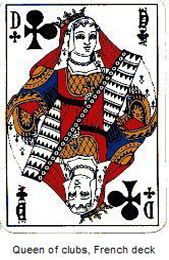 (n) A face card, the one that ranks between the jack and the king, of which a standard deck contains four, one each in the spades (♠), hearts (♥), diamonds (♦), and clubs (♣) suit. (n phrase) 1. 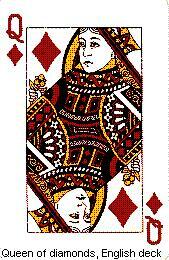 In high poker, a no pair hand whose highest card is a queen. “I have queen high; can you beat that?” (Also, “I have a queen high; can you beat that?” The difference is that word “a.”) “Yeah, I got king high.” 2. 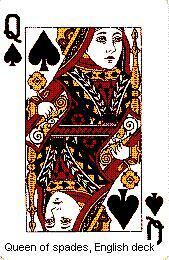 In low poker, a hand topped by a queen. (n) A face card. In the English deck, the figure faces forward, tilted slightly to the left. She holds a flower in her right hand like the other queens. In the French deck the figure faces forward, tilted to the right. She is the only queen with no flower. The index is D, for dame, the French word for lady. Known in the French deck as Argine. (n) A face card. In the English deck, the figure faces forward, tilted to the right. She holds a flower in her right hand. In the French deck the figure faces forward, tilted slightly to the right. A flower grows out of her left shoulder. The index is D, for dame, the French word for lady. Known in the French deck asRachel. (n) A face card. In the English deck, the figure faces forward, tilted slightly to the left. She holds a flower in her left hand. This is the only figure not facing the opposite direction of the French counterpart. In the French deck the figure faces forward, tilted to the left. She holds a flower in her right hand. The index isD, for dame, the French word for lady. Known in the French deck as Judith. (n) A face card. In the English deck, the figure faces forward, tilted to the right. She holds a flower in her right hand and a scepter in her left, the only queen to be holding such. In the French deck the figure is seen in profile, facing left. She holds a flower in her right hand. The index is D, for dame, the French word for lady. Known in the French deck as Pallas. 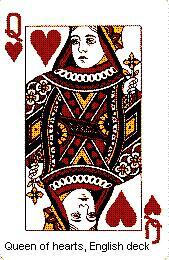 (n) A form of high draw poker, usually found in home games only, in which a player cannot open the pot without holding at least two queens as openers. Compare with jackpots. (n phrase) A full house consisting of three queens and a pair. (n phrase) 1. Queens up. 2. Queens full. (n phrase) Two pair, the higher of which are queens. (n) Any of several cheating devices, such as a holdout machine. (n phrase) In hold’em, Q-T as starting cards. Comes from the initials. (n; imitative) 1. In lowball, a 9. 2. In hold’em, Q-9 as starting cards. Quinine can sort of be drawn out of Q-9. (n) 1. Straight flush. This usage is rare. 2. In hold’em, Q-T as starting cards. (n phrase) Royal flush. This usage is rare. (v) 1. Cash in your chips and leave a game. 2. Fold. (n phrase) 1. In a home game, the prearranged time at which the game is supposed to end. (This is often violated when the losers insist on playing “just one more round” or “just another hour” in a usually vain attempt to recoup their losses, and the winners sometimes accommodate them, knowing the losers will likely lose even more.) 2. In a cardroom that does not stay open around the clock, closing time, at which point the house stops dealing and the game is over until the room reopens. (n) The minimum number of players, usually six, required to start a poker game. This usage is heard mainly in home games. Online and sometimes in brick and mortar casinos, short-handed games, often heads up, are common. (n) In hold’em, Q-T as starting cards. Comes from the initials; Q-Tips are a brand of cotton swabs.